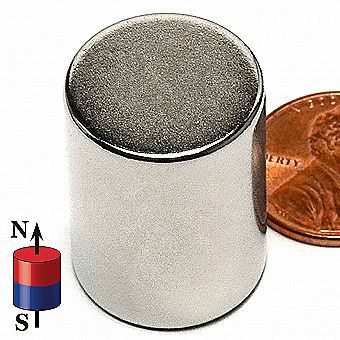 This product measures 3/4" in diameter and 1" in thickness and is made of a grade N42 neodymium, iron, and boron magnetic alloy blend. This magnetic blend is patent licensed and made under the ISO 9001 quality systems. They are plated in a nickel-copper-nickel coating for a shiny corrosion-resistant finish. The North and South poles are on the flat sides. The pull force of this magnet is 67 lbs. This is a great item for use in personal projects as well as for crafts and closures and can also be used to help keep objects secured or fastened to any ferrous surface. Pole Orientation: Axially magnetized, the poles are on the flat ends.